Two athletic 24-year-olds set new records in Saturday’s 36th annual Baldy Hill Climb organized by the Sun Valley Ski Education Foundation and sponsored by Sturtevants, Salomon and Sun Valley Resort. University of Utah All-American cross-country skier Miles Havlick emerged from the mist shrouding the 9,020-foot summit of Bald Mountain to win the Men’s Racing event in 35 minutes and four seconds. It broke the 25-year-old record of Michael Tobin (35:11) set way back in 1989. Havlick, member of the SVSEF Gold Team and a Colorado native, finished 64 seconds faster than seven-time Hill Climb king Miles Fink-Debray (36:08) of Ketchum. Winner of the women’s race ascent on the 1.86-mile, 3,140 vertical foot course was SVSEF Gold Team Nordic racer Mary Rose (42:44). Setting a new record in the bike race was 24-year-old Joshua Berry of Ketchum and Tucson, Az. Berry placed fourth in the Pro Men’s class of the USA Cycling Marathon Mountain Bike National Championships July 5 on Baldy. Berry attacked the Cold Springs trail for a time of 1.03:31, breaking the previous record held by this year’s Cheeso Double men’s king Richard Feldman (1.48:23). Feldman was second to Berry in the bike race alone, about two minutes behind him. Winner of the women’s Cheeso Double Saturday for the first time was Ketchum’s Muffy Ritz (2.28:36). Both Havlick and Berry earned $100 bonuses for their record-breaking efforts. Race organizer Rick Kapala, SVSEF Nordic Program Director said, “This year’s participants were greeted with near perfect conditions, cool and overcast. Though the skies were threatening, the day held much promise as course records were beckoning the athletes with the lure of glory. Referring to Saturday’s memorable Men’s Racing Class finish, Kapala said, “The men’s Hill Climb record has seen very few challengers over the years. It was set in 1989 by Michael Tobin. “His standard of 35:11 had been approached only by Miles Fink-Debray’s 35:33 in 2006 and Rob Whitney’s 35:52 in 1999. Along with Michael, they were the only competitors to ever go sub-36 minutes. “This year the field included strong contenders. As the race developed, Miles and Miles pulled the pack up the hill and separated from the crowd as they climbed into the mists shrouding the top of the mountain. 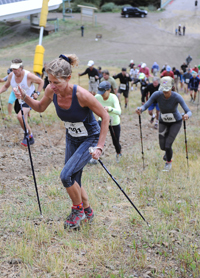 “At the top of Baldy the pack of spectators watched the big race clock and listened for shouts of encouragement from below all the while wondering who would be the first to emerge from the swirling clouds and would they be on pace to challenge the record. “At 34 minutes the first cheers were heard from below and everyone knew a record was possible. And in the next few moments, Miles Havlick emerged from the uncertain weather and weight of history to establish a new men’s Hill Climb record of 35:04. On the women’s side of the Hill Climb, SVSEF Nordic Gold Team member Mary Rose won her first BHC posting a very strong 42:44. She was followed by local Brooke Hovey at 43:06 and SVSEF Nordic Skier Makayla Cappel (former NCAA Nordic All American) at 48:04. The Cheeso Double saw some familiar faces at the top with Richard Feldman leading the Cheeso in 1:48:23. Eric Chizum had a strong Hill climb to earn second in the Cheeso at 1:51:47 with John Reuter nabbed his second podium of the day in third place at 1:55:30. Muffy Ritz stayed strong after the bike race to ascend the hill with panache and earn her second win of the day with a first in the Cheeso Double in 2:28:36. Mirroring the finish of the bike race, Janelle Connors 2:41:50 and Jessica Kisiel 2:46:42 stayed atop the podium for second and third in the Double. Kapala said, “Thanks again to Sturtevants and Salomon, our event sponsors, to the Sun Valley Resort for the support with lift services and facilities, and to Durance Cycle, The Elephant’s Perch and Backwoods Mountain Sports for raffle prizes.